I am not even going to attempt to summarize the plot to this book. It is far too epic, too gargantuan, to summarize. Sorry ’bout that. 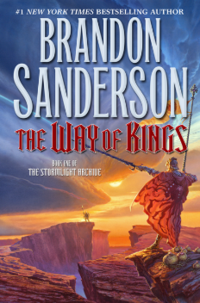 So…more high fantasy from Brandon Sanderson. What can I say? I like the guy. I like the way he writes. And I’ve been on a real fantasy kick for all of 2012 so far. It’s what’s appealing to me right now. Nothing else, really, has been crying out to me. So even though this is a bit weird for me, I’m just going to roll with it as long as the mood lasts. The Way of Kings is a very good book. I do have to say, though, that I’m really glad I didn’t start with this one when I decided to give Sanderson a chance. If I had, I would have given up pretty quickly and written the guy off as not for me. I never would have read the Mistborn trilogy, which has become one of my favorite reads of the year, and I definitely wouldn’t have made it far enough into this book to enjoy it. See, Mistborn wasn’t that high when it comes to fantasy. It was far more mild: a world that in many ways seemed related to our own, a magic system with its own rules, and a class conflict. I can deal with that. Really, that’s not all that different from, say, Harry Potter. But The Way of Kings? Completely out of my comfort zone. Everything about this world is different – races/species, animals, plants, history, cultures, languages, names, terminology, religion…everything. And for about the first 400 pages, it was a struggle to adjust. This book is just over 1000 pages long, and it’s not a standalone. I believe, actually, that this is the first book in what is supposed to be a massive, multi-book long epic. [Wikipedia tells me it will be ten volumes long.] It introduces a new world, multiple plots, tons of characters, and the threads of many plots-to-be. The story switches from one character to another in only tangentially-related plots, until I was completely dizzy. Between trying to keep track of who was who, and what was what, and when was when, and simply figuring out how this world worked, it took me a long time to really get into the book. “Long” meaning, as I said above, 400 pages. I kept going because Sanderson has proven to me in the past that he can pull off a fantastic book. If it had been by anyone else, I would have given up. Those first 400 pages were HARD. But I persevered, and I’m happy that I did. In the end, it was worth it. I am really looking forward to the next installment of this series. There are sooooo many unanswered questions here! I didn’t mind that, because I can tell that many of them are left that way intentionally, to be addressed in further volumes. This is only the beginning of what promises to be a fantastic ride, and I’m glad I’ll be along for it. Note: This book was reread and re-reviewed in Jan 2016. This entry was posted in 2012, Adult, Prose and tagged speculative. Bookmark the permalink.